I have a challenge with multiple plot. I want to select different plots in multiple plot when mouse is moved along them or along other xy graph that it is synced with it. could you please specify a bit more in detail what is the 'challenge' for you? So, whithin a while loop that never stops, an event structure recognizes the mouse moving over the XY Graph. 1b. Right-click on the event structure, select 'Edit Events Handled by This Case'. 1d. select 'Mouse / Mouse Move' in the right list of the 'Edit Events' window. 2. 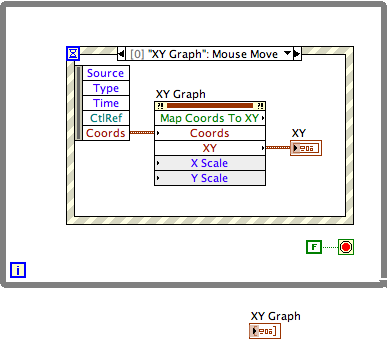 Create an Invoke Node by right-clicking on the XY Graph, select 'Create / Invoke Node / Map Coordinates To XY'. Wire as shown above. 3. Create the 'XY' indicator to see the xy value cluster where the mouse is actually hovering over the XY plot. 4. Place that code within a while loop with the conditional terminal wired as shown above. As a second step, you would have to check whether the xy value of the mouse matches one of your plotted values. But before I develop all this code here, please specify your needs in detail first. P.S. 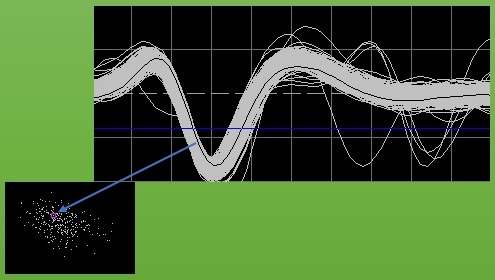 Your example looks like a spike sorter - neurophysiologists use such a tool to sort action potentials generated by different neurons within the recording of one single electrode. Is that what your tackling? Hello ulricius and thank you for your reply. After creation this post,I was trying about it and I achieve answer. Please check attach and tell me your opinion about it and if you think that there is another way,don't hesitate to say it to me. Also I have another question and I'm sure that you can help me. I have a xy graph contains a number of points and I want to select a part of them similar to ROI and their colors be changed and also, can select a number of ROI in that. Your guess is correct. I'm tackling about it and I'm happy to receive your experiences and learn about it from you. 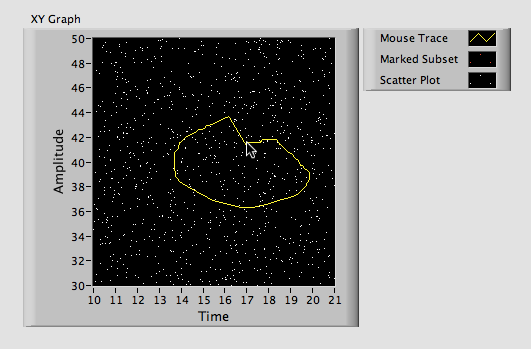 First, you will have to track (and draw) the mouse movement after the user started to mark values. Second, you will have to select the subset of values that lie within the marked area. 1a. : Use an event structure to let the program know when 'XY Graph: Mouse Down' happened. 1b. : Within that event case, register for 'XY Graph: Mouse Move' events. 2.: Use a dynamic 'XY Graph: Mouse Move' event to collect (and draw) all the pixels the user moved the mouse over when marking an area on the XY Graph. 3. If the dynamic event 'XY Graph: Mouse Move' is active and the user performed any 'Mouse Up', unregister from the mouse move event. I will have to stop here, because it would mean to much discussion without the possibility to develop some example code. If you don't get along yourself until thursday, we might continue our challenge later! Thank you ulricius and I'm waiting for your experiences. Hi MikaeIH and thank you very much. your problem challenged me a bit on this saturday afternoon. Experience tells me your users will prefer to have the possibility to draw figures of any arbitrary shape and not be restricted to rectangles? The VI is saved in LabVIEW 2013. Earlier versions don't have some of the features that I used - I hope that's ok? Next what you have to do is to find the values that lie within your figure. A tricky task, though. Hello ulricius and sorry for my late response. It's perfect.Thank you very much. You're right and I prefer to draw figure of shape freely around a number of points. Of course I want to draw a number of figure of shape and after studying your program,I'll modify it for multi-draw. 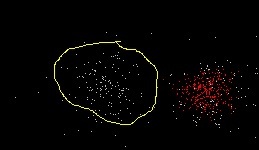 I want to select a number of points that those are a part of a feature space for detecting their spikes from others.